Next year marks the 50th anniversary of Earth Day. One of my aunts has told stories about going out with her class to clean up a wooded area near her elementary school during that first Earth Day. The idea for a day to focus on the environment came from U.S. Senator Gaylord Nelson, of Wisconsin, after he had witnessed the damage caused by a massive oil spill in Santa Barbara, California, in 1969. Senator Nelson announced the idea for a “national teach-in on the environment” to the national media, and recruited Denis Hayes from Harvard as national coordinator. Hayes built a national staff of 85 to promote events across the land. April 22, falling between Spring Break and Final Exams, was selected as the date, according to earthday.org. On April 22, 1970, an estimated 20 million Americans took to the streets and parks to demonstrate for a healthy, sustainable environment in massive coast-to-coast rallies, according to earthday.org. Today, Earth Day is considered the largest secular observance in the world, celebrated by more than a billion people every year, “and a day of action that changes human behavior and provokes policy changes,” according to earthday.org. So what can you do on Earth Day – and every day, for that matter – to help save the Earth? Remember: Even the smallest of things – like not littering or leaving the faucet running while brushing your teeth – can help! Have a great weekend and a great Earth Day. 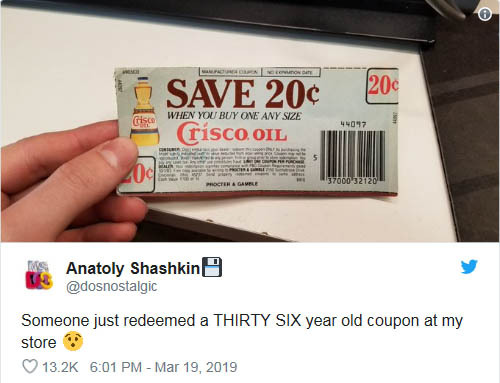 Just the other day I read that a customer recently came into a North Shore Farms supermarket in Mineola, NY, with a coupon to save 20 cents on Crisco oil from 1983. Believe it or not, that’s a 36-year-old coupon! The manager of the store even posted a photo on Twitter. And so as I was going through a circular and cutting out coupons in anticipation of this weekend’s grocery shopping, I began to think about the history of coupons. Then, in 1909, C.W. Post began offering coupons with a one-cent discount on Grape Nuts cereal. Coupon usage really surged during the Great Depression, as struggling consumers used coupons to trim their grocery bills. By 1940, chain supermarkets began offering coupons as a way of taking customers away from neighborhood stores. Then, in the 1990s, the first Internet-delivered, printable coupons were created. Think of this long and interesting history the next time you use a coupon! Since we’re discussing coupons, I just want to remind all panel members to please let us know if you use a special deal like a coupon, discount, or store sale. Also, while many coupons have barcodes on them, please do not scan the barcode on the coupon. Although the scanner or NCPMobile App may accept the barcode, the information is not readable to us. Sunday is St. Patrick’s Day. As is our tradition, our family spends time with some friends and neighbors. We’ll all dress in green and enjoy some traditional foods, such as corned beef and cabbage, and Irish soda bread. What about you? Do you celebrate St. Patrick’s Day? If so, let us know! Blue, not green: St. Patrick’s color was “Saint Patrick’s blue,” a light shade. The color green only became associated with the day after it was linked to the Irish independence movement in the late 18th century. Patrick was British: Although he made his mark by introducing Christianity to Ireland in the year 432, Patrick wasn’t Irish himself. He was born to Roman parents in Scotland or Wales in the late fourth century. It might have been St. Maewyn’s Day: According to Irish legend, St. Patrick wasn’t originally called Patrick. His birth name was Maewyn Succat, but he changed his name to Patricius after becoming a priest. About those shamrocks: According to Irish legend, the saint used the three-leafed plant as a metaphor for the Holy Trinity when he was first introducing Christianity to Ireland. Since we’re talking history here, let’s acknowledge today, March 15, which is the Ides of March. (You might have heard the expression, “beware the Ides of March.”) This marks the day in 44 B.C. that conspirators led by Marcus Junius Brutus stabbed Julius Caesar to death before the Roman senate. This was a significant turning point in Roman history. Well, let’s end this history lesson by wishing you all a happy and safe St. Patrick’s Day! Whether you like it or not, on Sunday at 2 a.m. we’ll be turning the clocks ahead an hour. After speaking about it with people in our office, I realized how divisive this event can be! While some like the extra daylight when they leave the office, others complain about how tired they are for several weeks until their bodies adjust. What do you think of Daylight Saving Time – good thing or not so good thing? Daylight savings can cause sleep deprivation: By springing ahead, we can alter our circadian rhythm and this can throw us off for several weeks. DST can put people at greater risk for cardiovascular conditions: A 2014 study found that on the Monday after DST begins, 24% more people have heart attacks than on other Mondays throughout the year. On the flipside, the study noted a 21% decrease in heart attacks the Tuesday after DST ends. It can lead to an increase in workplace injuries: The 2013 Bureau of Labor Statistics’ Survey of Occupational Injuries and Illnesses reported a rise in injuries in the summer months – and a decrease in November and December, after a return to standard time. And more car accidents: Austin C. Smith, an assistant professor of economics at Miami University, reports a 6.3% increase in fatal car accidents for six days following the spring time change. You might be less productive at the office because of DST: DST might also be to blame for “cyberloafing” – the act of wasting time online at work. A series of studies conducted at Pennsylvania State University in 2012 found that on the Monday after the time change employees are more likely to browse websites unrelated to their job. In the Western world, we typically spend more awake time in the evenings than in the mornings. We also enjoy many benefits from being awake in the sunshine. This leads to an increase in vitamin D, increased exercise, increased socializing, and overall improvements to mental health that come with sunlight. A paper from the Brookings Institute finds that there’s a 7% decrease in crime following the shift to DST. In 2007, when DST was extended through November 1, that drop resulted in an estimated $59 million in savings from robberies not committed. The reason is simple: crimes tend to happen much more often in darkness. Extend the daylight, and crimes, especially outdoor crimes like muggings, go down. Opponents of DST note that, in the week following the spring clock change, traffic accidents spike. But, DST lasts eight months, not a week, and the net effect of DST on traffic accidents is overwhelmingly positive. In fact, studies actually estimate that we could save about 366 more lives per year if we extended DST all year round. It is, very simply, easier to drive in daylight. So remember to move any clocks – at least those that are not connected to the Internet in some way – ahead one hour. Have a great weekend, and I hope you’re not too groggy on Monday! Like almost everybody else, I LOVE coupons! And I’m sure most of you do, too. In fact, according to CreditCards.com, 85% of Americans use coupons. Do you use coupons? If so, where do you get your coupons? Oh, and another thing: A few times I’ve forgotten to bring my (paper) coupons with me to the store. Anyone have any suggestions for remembering to bring and use their coupons? Let us know by leaving a comment! Many coupons have barcodes on them. Of course we want you to tell us about any coupons you use, but please do not scan the barcode on the coupon. 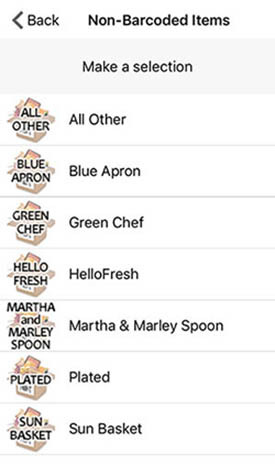 Although the scanner or NCPMobile App may accept the barcode, the information is not readable to us. Well, I have to get back to clipping my coupons! Have a great weekend, and happy shopping!